I always try to get to San Pedro Sula by 6 or 7am so that I can get to my final destination before nightfall. From anywhere in San Pedro Sula, take a taxi to get to the bus station with the buses that go to Puerto Cortes. After an hour or two, you’ll be arriving in the port city of Puerto Cortes — this bus ride should cost you around $2. 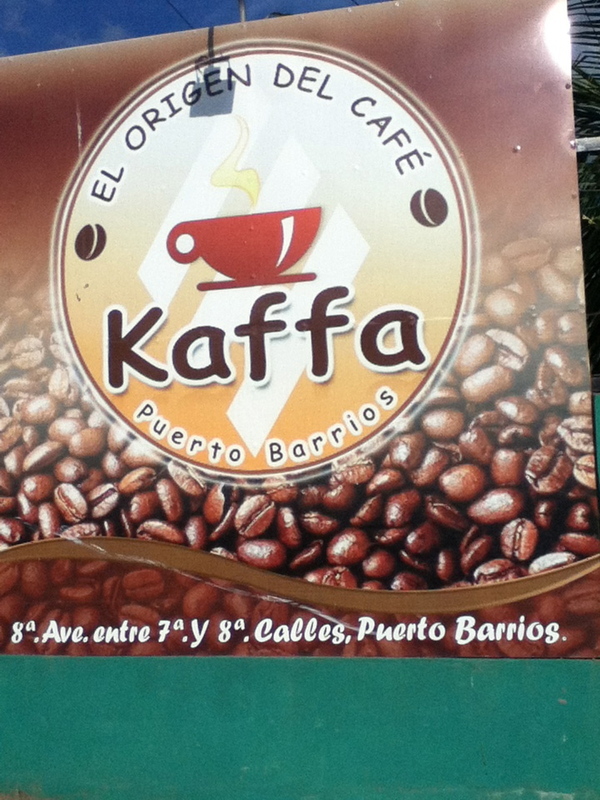 From here, ask for the bus station in town with the buses that go to the “frontera”. It’s a few blocks away from the center of the city so you can walk there or take a taxi. After another hour or two, you should be arriving at the Honduras-Guatemala border — this bus ride should cost you around $2. At the border, you’ll go through a police checkpoint where you’ll need to present your passport. The police officers there carry intimidating weaponry like AK-47s and M-16s. But not to worry. Most of the police officers I’ve met on the Honduran-side of the border are quite friendly and sometimes hilarious. Unless you get there when the police officers are having a bad day, you shouldn’t have problems here. During one occasion, a group of these police officers bought me snacks because they had heard about SHH in the media and wanted to thank me. I was so flattered! You’ll walk towards Guatemala for a minute or two and probably wonder if you’re going the right way — there aren’t too many signs directing you to the immigration office. Go to the Honduran immigration office where you’ll need to present your passport again. They will give you a stamp on your passport saying that you departed Honduras. From there, keep walking towards Guatemala — no worries, you just have to keep walking straight. After you’ve walked about 100 yards, you’re already in Guatemala! I usually will eat a little lunch for about $2-$3 at the little food stand there. This is also a good place to exchange some Lempiras for the Guatemalan Quetzales. It should be about 2.5L for 1Q but make sure to check the exchange rate prior to your trip so you don’t get jipped too badly here. The good thing is, the workers there normally charge a decent rate and I’ll end up losing just a few backs on the exchange. Although you can take a taxi to Puerto Barrios, you will save a few bucks by taking the mini-buses that stop in front of the one food stand. They come and go very frequently — I’ve never had to wait for more than twenty minutes to catch one. This ride should be about $5. One time when I paid with a big bill (I had just gotten my Quetzales), the bus driver pretended like they didn’t have change at the moment. I had to remind them a few times to give me my change, and they finally did when I got off the bus and asked a bit more firmly. So pay the exact amount if you can. This bus also tends to be full of immigrants taking the trip to cross the border into the US. It always amazes me how little they pack — usually a small backpack or nothing at all. Make sure to tell the driver that you need to go to the immigration office. “But didn’t I just go through immigration?” you might be asking me. Well this time, you need to go into the Guatemalan immigration office, which is located about ten minutes into the minibus ride to Puerto Barrios. Get off the minibus and tell the driver to wait for you. You will go into the tiny office and give the dude there your passport. He’ll give you a stamp marking your arrival into Guatemala. You’ll have to pay a few bucks for your entry tax. After you get your passport back, hope back on the minibus. After about an hour and a half (the bus takes a few detours), you’ve made it to Puerto Barrios! 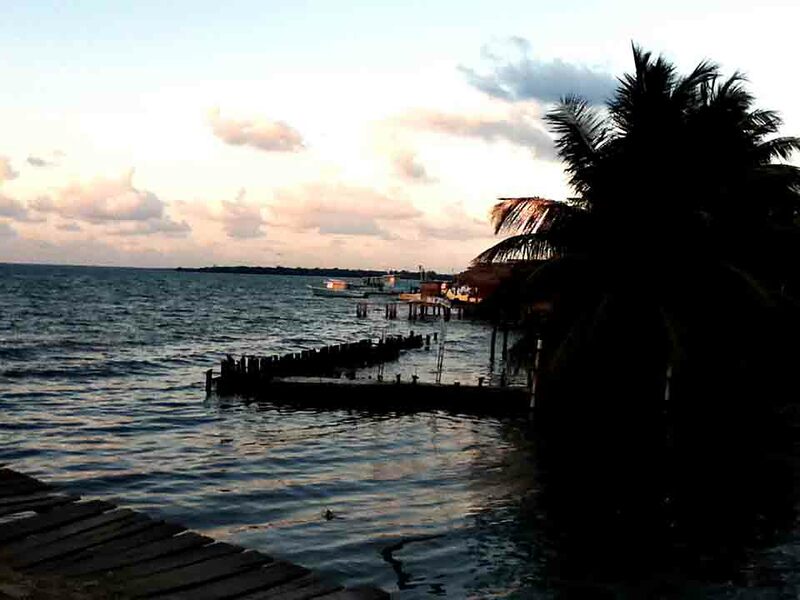 Although I’ve made trips to other places from there, like Livingston or even Belize, I’ve been just staying in Puerto Barrios recently. It’s a big enough city where I can find most things I need, and it’s the closest city from the border so my trip back to Honduras will be kept as short as possible. Technically, you’re supposed to remain in Guatemala for 72 hours, but I normally just stay for one full day and two half days on the days I travel to and from Guatemala. I’ve heard of people staying for even shorter before they head back to Honduras. On your way back to Honduras, repeat basically the same process, just backwards. You can catch the same minibus to the border at the main market, as early as 5am. 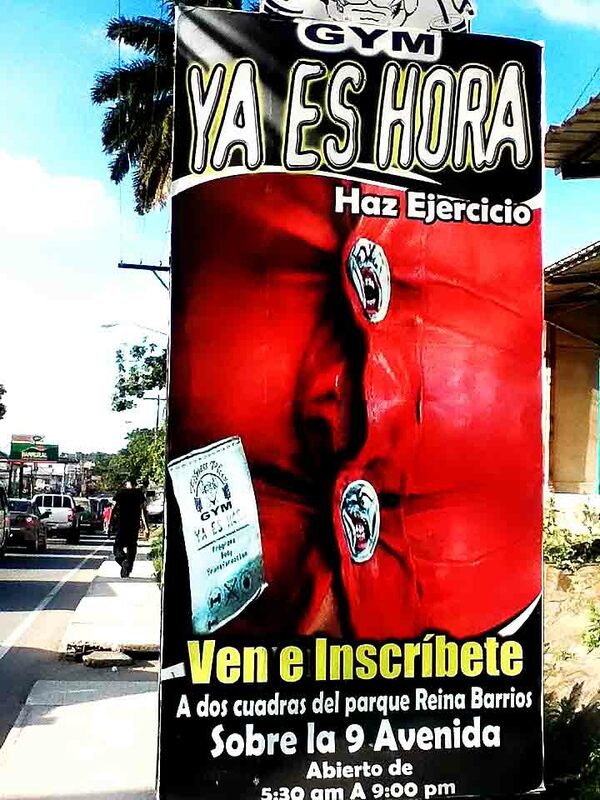 Make sure you get your 90 day visa stamp at the Honduran immigration office, and you’re good to go! You can walk down a few blocks from the center of town and see the ocean. I didn’t see any beaches and the streets were somewhat sketchy-looking so I wouldn’t recommend doing this if it’s already getting dark out. A dude with huge biceps who had obviously been lifting some weights told me to walk to the main park in town (where they have street food and a public futsal court with flood lights) and then walk about three blocks away to get to the gym. I got lost and had to ask for directions multiple times. But it was all worth it because the gym was surprisingly huge, complete with multiple benches, multiple squat racks, nice dumbbell set, weight machines, cardio area, and even Tae-Bo classes. I paid a few bucks to get a day pass and worked out for about an hour and a half. I felt great afterwards, and even made a few friends who helped spot me with the bench press. This cozy and nicely-designed coffee shop is located across the main park. They had great coffee and free WiFi, two things I love. You even get a free refill and a small cookie with your order of drip coffee. They had crepes, sandwiches, and a few other things to eat but the prices were a bit too high for me to try out. I enjoyed reading on my Kindle here while watching the futsal games at the park, and the workers were pretty friendly. They’re also open until 9 or 10pm. 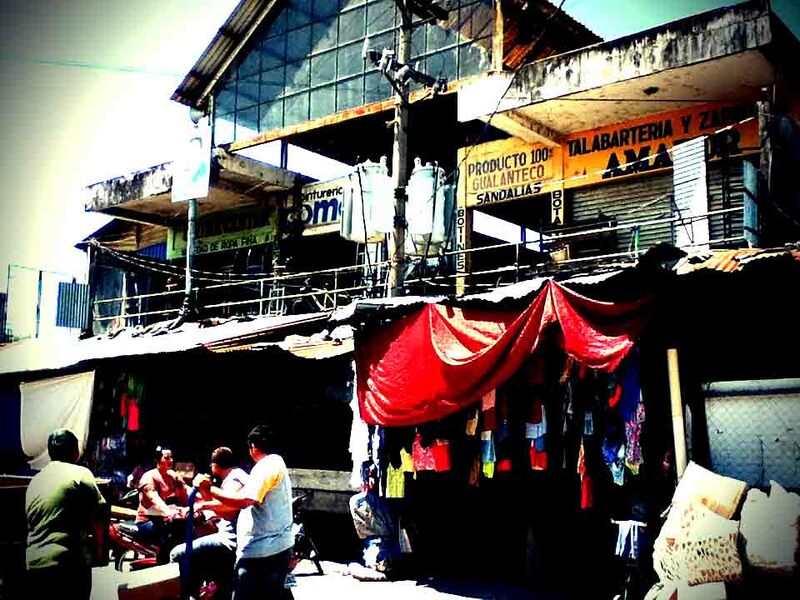 The main market in Puerto Barrios seems to mark the very center of the city — everything revolves around this place. You’ll most likely get dropped off from the border bus right in front of the market. They have all kinds of junk here for sale, like pirated CDs, clothes, live chicken, produce, cell phones, etc. I normally eat all of my lunches here since they have a bunch of very cheap food stalls where you can eat for about $2 – $3. This is the hotel where I usually stay in since it’s conveniently located right next to the main market — just ask for it and people will help you find it. 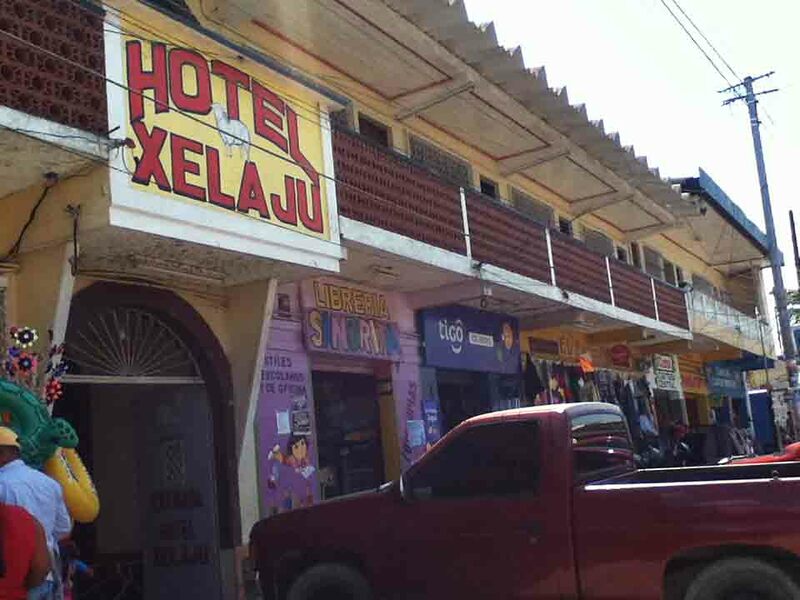 There are only a few hotels in town, including a Hotel Xelaju II which is a few blocks farther out so the options are very slim. For about $10, you get a room with a private bathroom, TV with cable, and working fan. No complaints there. Compared to the worst hostels I’ve stayed in, Hotel Xelaju gets the job done. When I get hungry in the middle of the night, I just walk quickly to the mini-mart around the corner to stock up on snacks.